Neck and back pain is no fun, but it could certainly be worse. I am thankful for my overall health. While the meds help with the pain, they keep me very tired and, well kind of, in la-la land. I think I’d rather be in another place. I have been having some very interesting dreams at night though. I just started cooking a bit again. I’ve been making easy recipes that don’t keep me up very long, but satisfy my desire for fresh, flavorful food. 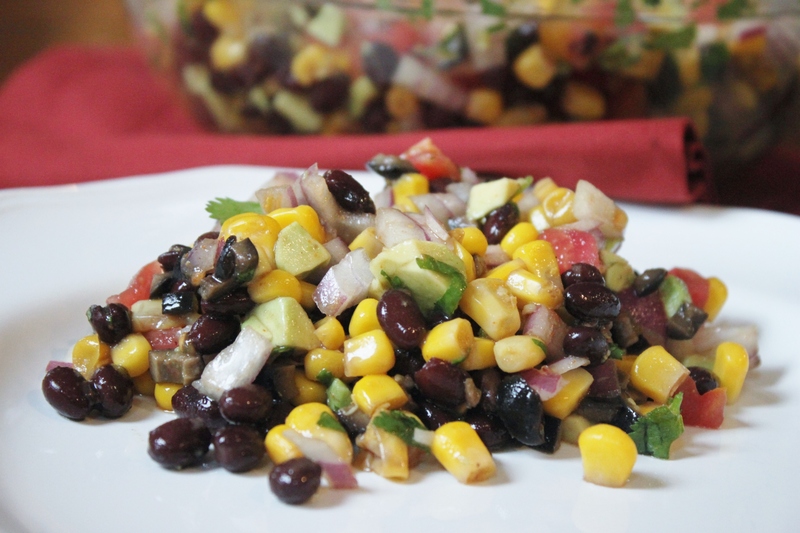 Our lunch today included this yummy black bean and corn salad. It was very quick and easy to prepare — just what I needed. Avocado, cilantro and red onion were great fresh additions. Here’s an easy flavorful and healthy salad, ready in just five minutes — can’t beat that! Here’s one of our family’s easiest, flavorful, healthy and colorful salads! Add all ingredients to a large bowl and chill.